At an age when Ladies were expected to behave in a certain manner, Camille du Gast did what she wanted and paid little regard to convention. If you think that sounds like a selfish person you would be very much mistaken. Marie Marthe Camille Desinge du Gast was born in the French capital of Paris on the 30th of May 1968. She was the youngest child of the family with two elder sisters and a brother twelve years her senior. Perhaps this is the root of her tomboy, or 'garçon manqué', mentality as she must have had to fight to keep pace with her brother and sisters. She developed a bewitching smile and lively sense of humour, traits that later in life must have helped in Camille being cited as the most beautiful woman in Paris. At the age of 22, in 1890, Camille du Gast married Jules Crespin. Crespin was manager and majority shareholder in one of the largest department stores in France. His father Jacques Crespin had established the Le Palais de la Nouveauté department store in the 18th arrondissement of Paris in 1856 but by 1890 a change in ownership saw the store name changed to that of the leader of the new take over, one Georges Dufayel. Crespin stayed on as manager of Dufayel’s and was very supportive of his wife’s unusual pursuits, however he insisted she use her maiden name. It would have been rather unseemly had people misconstrued her activities as ‘publicity stunts’ for the Dufayel Store. At this time not only was Camille a society member but a woman caught up in the romance of noble deeds and the pursuit of unreachable goals. She was always combative in nature, daring and full of ambition. Amongst her ‘hobbies’ were fencing, tobogganing, skiing, rifle and pistol shooting and horse training! It was her more outrageous pursuits that marked her out from other ‘ladies’ of the time. Both Crespin and Camille were enthusiastic hot air balloonists. Le Palais de la Nouveauté department store actually owned two balloons which were used to publicise the department store. Semi-professional pilot Louis Capazza was often seen flying with Madame du Gast at fêtes and public events. In 1895 it was from one of these balloons that Camille reportedly made an historic parachute jump. From a height of 2,000 ft (610 mtrs) Camille du Gast became the first woman to use a parachute, and set a height record for doing so too. Both these claims have been challenged academically but there is just as little evidence to disprove them as there is to prove them. When Jules Crespin died, in around 1896, the 27yr old Camille was left as a very wealthy widow with a young daughter. Far from daunted she took up even more sporting activities and travelled extensively. After watching the start of the 1900 Gordon Bennett Cup race from Paris to Lyon Camille became an enthusiastic motorist. Along with Anne de Rochechouart de Mortemart, Duchess of Uzès she was the first woman to apply for a driving licence. In fact Camille du Gast was one of three pioneering French female celebrities of the Belle Epoque. Hélène de Rothschild (Baroness Hélène van Zuylen) and Anne de Rochechouart de Mortemart (the duchesse d’Uzès) being the other two. Being "one of the richest and most accomplished widows in France” kept Camille active on the Parisian social scene, rubbing shoulders with personalities and political leaders helped her develop political connections which would become very useful in her later life. By 1901 was so involved with motoring that she entered the 1901 Paris-Berlin race driving her late husband’s 20CV Panhard-Levassor, not at all a racing design. Also racing in the event was Baroness Hélène van Zuylen (wife of the President of the Automobile Club de France), they were the only two woman entrants and this established Camille du Gast as only the second woman to take part in a motor race. Riding with Camille, as mechanic, was Prince du Sagan, Hélie de Talleyrand-Périgord. The organisers decreed that as a novice woman driver, in a non-racing machine, Madame Camille du Gast must start off last of all. The race was run in three legs – the first on the 27th of June went from Paristo Aachen; a distance of 459 kilometres (285 mi). The next day the race ran from Aachen to Hanover, another 447km (278 mi). The final day of the race, the 29th of June 1901, saw the final 299km (186 mi) from Hanover to Berlin. It was a timed affair just like all the city to city races, and the long three day system was also similar in style to the great cycling events that had also blossomed across France. Henri Fournier won overall in a time of 16 hours 5 minutes, and average of 44.12 miles per hour, Camille had raced so well that her number 122 Panhard came in 33rd place overall in a time of 25h30m23s; good enough for 19th in heavy class. Baroness Hélène Zuylen was halted by technical problems on the first day so Mme. du Gast took the plaudits for her successful finish, Camille was relatively pleased but determined to do better next time. whether fierce long-distance racing is quite the thing for ladies." Camille took a long cruise which precluded her from any other racing events that year. In 1903 though she was engaged by Adrien de Turckheim to drive a 5.7 litre 30 hp De Dietrich, a true racing car with aerodynamic bodywork! Camille started 29th and gained 9 places in the first 120 km (75 mi). Her aggressive driving saw her running as high as 8th when she came across a crash near Libourne just outside Bordeaux. Recognising the car as another De Dietrich she stopped to give aid. Englishman Phil Stead had been pinned under his car when it rolled into a ditch. Mme. du Gast’s riding mechanic was able to move the car sufficiently for her to nurse the injured man until an ambulance arrived. Doctors who later treated Mr. Stead said Mme. Du Gast's first aid had probably saved his life. The ‘Race of Death’ was stopped by the French Government at Bordeaux due to the high number of accidents and awful fatalities. Du Gast had rejoined the race but her impressive efforts ultimately came to naught. She was placed 44th at the time the race was stopped. On the basis of her performance in the 1903 race the Benz factory team offered her an opportunity to drive one of their cars in the 1904 Gordon Bennett Cup. However the worsening political attitude to road racing led to the French government, citing 'feminine nervousness', barring women from competing in motorsport. Mm. Du Gast did write a letter of protest in April 1904 which was published in L'Auto; it had little effect. Camile’s skills were never doubted it was simply a reaction to the tragic events of the 1903 Paris-Madrid race. Possibly spurred by such events Camille du Gast pushed to become an official of the Automobile Club de France (A.C.F.) on the 1st of December 1904. She also took advantage of the fact that no such rules existed in Britain and in July 1905 took part in the inaugural Brighton Speed Trials. Camille drove a 35 hp car in the handicap event but couldn’t compete with Dorothy Levitt‘s 80hp Napier. Levitt also used this car to set a World Speed record for Ladies. Back in France du Gast’s protestations at being banned from motor car racing came to nothing so Camille turned her racing interests in another direction; motor-boating. Racing motor boats had become popular in the early 20th century. The ‘Launch’ industry in France was only around five years old at the time but gaining technological pace and public interest at a rate which rivalled that of motoring in the 1890s. In fact the 1905 nautical racing calendar exceed in number, and importance, that of the automotive racing calendar! Clearly motor boat racing was in vogue and attracting a lot of much public attention. Mme. du Gast piloted a Marsoin launch, powered by a Darracq engine, on the river Seine at Juvisy-sur-Orge, Paris, in September 1904. It is reported that Camille attracted a lot of attention of her elegant attire. During the 2nd to the 16th of April 1905 the first event of the nautical season began at Monaco. It started with an exhibition of all types of motor-boats which lasted until the 9th of April when the actual racing began. For the size on the entry list this event was without precedent in yachting history. Camille du Gast used her boat La Turquoise, a 'Tellier fils & Gérard' hull powered by a 150hp 6-cylinder Panhard engine, to enter the 100 kilometres race in the 8-12 metres classes but she 'did not finish'. The race was won by renowned motor racer S. F. Edge in his Napier II in 1 hour 5 minutes, interestingly, he came second too! His other ‘launch’ Napier I also listed Edge as a driver so he was entered on the results as was the custom of the time, despite never having taken the wheel. In May 1905 the Paris newspaper ‘Le Matin’ organised, and sponsored with Mercedes Paris, the trans-Mediterranean race from Algiers to Toulon. The French Minister of Marine supported the event by providing not only a prize but 'torpedo destroyers' to accompany each of the 7 competing launches. Mme. du Gast commissioned the Pitre Company of Paris to build a launch specifically for the event, a 43 ft steel hulled ‘Camille’ housing a 90hp Charron, Girardot et Voigt (C.G.V) engine. The launches and their escorts left Algiers at intervals from 06:00hrs on the 7th of May for the first 360kh leg of the race to Minorca. The second leg from Port Mahon, Minorca, to Toulon was disruptd and eventually swamped by a storm. Despite delaying the start to let the storm pass the launches became embroiled in it and most proved unequal to the weather conditions. Several launches were taken aboard the military vessels and some sank! Camille du Gast made the best progress but eventually even her launch succumbed to the sea and was taken in tow by the battleship Kléber. However the launch broke free and started to sink, Camille and her crew had to be rescued from the sea at around half past 5 in the afternoon of the 13th of May 1905. "Mme. Du Gast ... has sent 10,000f to the sailor who jumped into the sea from the cruiser Kléber and rescued her during the storm that scattered the racing boats." "The greatest sportswoman of all time"
This exuberant and daring woman was about to endure a traumatic and life changing event. Not a motoring crash or near drowning at sea, not a house fire or financial collapse, in many ways it was far worse. 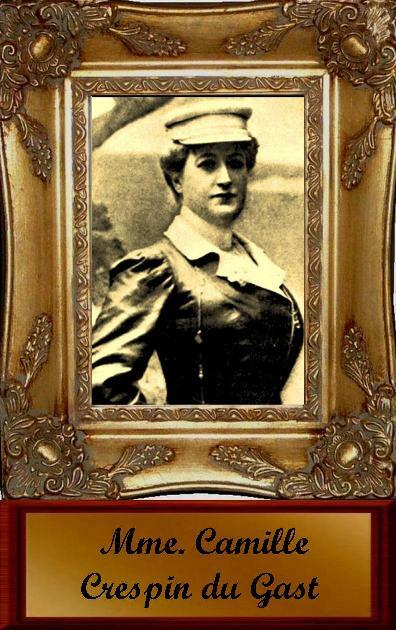 In 1910 her own daughter, described as a jealous and mercenary individual, was caught up in a plot to assassinate Mme. du Gast. “It was her daughter who put an end to this adventurous life. She had been trying for a long time to extort money from her famous mother. By the skin of her teeth, Camille escaped an assassination attempt, instigated by her daughter's ruffian friends, at her home in the middle of the night. She confronted them and they turned tail and fled. Faced with a daughter who had deceived her, nothing was ever the same for Camille after that." This attempt by her daughter to inherit through murder certainly had an effect on Camille. After this she devoted her life to charitable works with animals, disadvantaged women and orphans and helping the French Government’s work in Morocco. "adventured alone to Morocco, that country infested with brigands, [and] full of dangers for Europeans and especially for the French." Camille made two more journeys to Morocco, in 1910 and 1912, commissioned by the French government. The first trip was on behalf of the Ministry of Foreign Affairs, attempting to help the French government gain influence and demonstrate the benefits of French rule. She handed out medicines and sweets as well as working with local women. Camille du Gast was President of the 'Société protectrice des animaux' (SPA), from 1910 until she died. She started her charity work at the Paris refuge for stray and injured dogs, originally founded by Gordon Bennett in 1903, and by 1927 was using her own funds to modernize and enlarge the Gennevilliers animal shelter. Camille organised many protests against bull fighting, some included direct action. Bull fighting was technically illegal in France but organisers often found loop holes which the government were not bothered about closing. Mme. du Gast was also Vice-president of the Ligue Française du Droit des Femmes, or the French League for the Rights of Women. She saw to health-care for poor women and children, established provision for orphans and centres for impoverished women. After WWI she campaigned for the emancipation of women became increasingly concerned with Feminism. Her sporting prowess and social pre-eminence must had had a big influence in the victory of the feminist cause as it is recorded in the book ’50 years of feminism’ 1870-1920, published by the French League for Women's rights in 1921. Camille Crespin du Gast died on the 24th of April 1942 in Paris. She is interred within the Crespin family tomb in the Parisian Père Lachaise Cemetery. Camille had been honoured by the government as early as 1929 when the named the rue Crespin, in the Paris district of Ménilmontant, was amended to be the ‘rue Crespin du Gast’. She remains one of very few women to be remembered in this fashion. Her name was further given to the technical school at Chalon-sur-Saône, the 'Lycée professionnel des métiers de l'automobile Camille du Gast'. Above all the other things in her life Camille du Gast remained a lady. As part of her socialising, politicising and fund raising Camille would give piano and singing recitals, she was notably accomplished at both. She cared deeply for her fellows and did as much practical work as she did monetary giving. It is the fund raising and welfare work which for which she is best remembered but her skills in sports and Motor racing did much to challenge the thinking of ‘male superiority’ in the earliest days of the women’s rights movements. Being a pioneer member of the motor racing world and champion of feminist causes meant that she was both admired and detested in equal measure in her life time, but today Camille Crespin du Gast is surely a lady worthy of our admiration.